The creative process can be such a vulnerable place and as an artist it helps to have someone in your corner supporting you through your creative endeavors. Welcome Dean Jones! 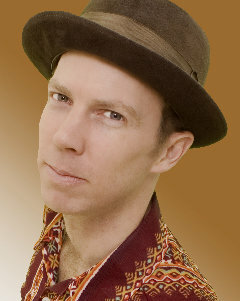 Musical maestro, Dean Jones, of the kindie band, Dog On Fleas, has played a major role in the production of many kindie releases over the past few years, including The Okee Dokee Brothers Can You Canoe? which won him a 2013 Grammy award for Best Children’s album. Dean lives in the Hudson Valley, which is also the headquarters of his “lovely straw bale recording studio” called No Parking Studio. In addition to producing, Dean spends time collaborating with fellow kindie musicians, providing support and lending his talents on a variety of instruments ranging from brass (trumpet, trombone) to the keys (or “ivories” as he puts it in Joanie Leeds’ song “Bandwagon“). Earlier this year, Dean released his third solo album titled When The World Was New, which will definitely be on our list of favorites for 2013. Its sound is an eclectic blend of funk, disco and folk and Dean’s voice has a warm quality to it that softly glides through each song. Dean is a busy man so when he agreed to participate in an interview with me, I was very grateful. In the following interview, Dean provides insight into his philosophy as a producer, as well as some inspiring advice on how thinking can be the enemy. Read on and then read my review which also contains a sampler of free songs from the album. Kids Can Groove: Were you a singer/musician before you started producing? Dean Jones: Yes, I’ve been playing in bands, and making up my own bands for a long time. All kinds of bands, usually strange and hard to explain. I’ve also worked with a lot of different kinds of artists, writing and playing music for puppet shows, shadow plays, art exhibits, and some other spectacular things. I love collaborating! KCG: What made you decide to get into producing? DJ: Well, I had a partner in crime for many years named Warren Perrins. We bought some recording equipment and just started recording our own bands because we thought we could figure it out ourselves. It took us a long time to really figure it out, though! But, ever since then I’ve really loved the challenge of recording and producing my own music, as well as other people’s music. KCG: Who was the first children’s artist you worked with (production wise)? DJ: Oh, well, first I started recording my own songs and then that turned into my band called Dog on Fleas. We’ve recorded 7 CDs. And next up was my great great great uncle, Uncle Rock. Actually, we’re not related, but he is great. KCG: How did you get into children’s music? DJ: I have had a bunch of bands (the Falling Wallendas, Harmonica Virgins, For Sale by Owner Orchestra, to name a few) and I’ve always written music that appealed to kids, but it was never called children’s music. All my bands have been very theatrical, ridiculous, childish, and fun. Eventually, a friend of mine pointed out that I was really writing music that kids like, so why not make a CD for kids. And, Dog on Fleas was born. KCG: What have you learned from your first collaboration/production up til now? DJ: Oh ho ho ho. So much I can’t tell you. I think the most important thing is that music is communication. If you are feeling uptight, tired or nervous, that’s part of what will be communicated. I think it’s really good to be clear about what you want to be communicating, and to whom, and then look at the big picture!!! You want it to sound fun; You have to be having fun. Recording can be tricky, but I think my strength as a producer is to get the musicians together and have them PLAY. PLAY PLAY PLAY. Not work. KCG: You have worked with an array of genres plus you are an artist yourself. What is your working philosophy? DJ: Oh, I just answered that in the last bit. I can say more. I like to create a working environment (even though I said it’s not work!) that encourages experimentation. Relaxed and fun, and you can try something and maybe fail at it, but it’s not a loss. Every song can turn out a million different ways. It’s a great challenge to draw out the essence of a song. KCG: How do you stay true to yourself as a singer/songwriter while maintaining an objective point of view as a producer? DJ: I try not to think. Thinking is the enemy. Oh, that also answers the previous 2 questions too. KCG: How do you find time to record your own songs? DJ: I have to go right now, I don’t have time to answer that. KCG: How does the process of writing and producing your own music compare to doing that for others? DJ: Sometimes I have to tell an artist that what they’ve just written and recorded is a really great song and sometimes they doubt themselves. My job is to keep them going in the right direction and making sure they know what their strengths and weaknesses are. It’s pretty much the same producing myself. Sometimes I don’t know if what I’m doing is any good. I have to play my music for other people and trust their opinions. I really believe in trusting, trusting, trusting and not overthinking. Just doing something is better than thinking about it. KCG: You are a multi-talented artist and bring World accents into many of the arrangements/albums you are featured on, as well as your own, using a broad range of instruments and even incorporating a foreign (French) language. It makes for some really interesting, eclectic sounds. Are you self-taught or have you taken lessons? DJ: I did take piano lessons when I was 8 years old for about 6 years, I think. I have always been a ravenous collector of instruments, sounds and music from around the world. I have tons and tons of instruments. And records. And sticks and rocks and pringles cans, and anything you could blow into or bang on. The area I live in, near Woodstock NY, is full of amazing musicians from all over the world. In the 70s and 80s there was a school called the Creative Music Studio here that Ornette Coleman, Don Cherry, Dave Holland, and so many other great jazz musicians, and I guess, World musicians taught. A lot of people came here to study jazz, but there was so much emphasis on just improvising with whomever you were with, and a lot of exploration of music styles from around the world. Many of the students of that school stayed here and hence there’s much more awareness of music from different parts of the world. I play with a lot of those folks in various bands. KCG: How did the theme for When the World Was New come up for you? DJ: I was in my backyard thinking about recording a new album OUTSIDE, just in my yard with an acoustic guitar and whatever else I could have out there. And then one of my neighbors started using a really loud leaf blower. IN THE SPRING!! That’s absurd!!!!! So I changed directions and wrote the song “Absurd” about how absurd we humans are. And then it got me on a new path, thinking about evolution, where we are and how we got there. It’s somewhat serious, but also silly. I think people are pretty ridiculous, so there’s lots to write about. I know I’m kind of ridiculous. KCG: It has some complex concepts which I think are fascinating for a children’s album. Did you think about how your audience would receive it? DJ: Yes, at times I wondered if it was going to be a children’s album. I had to ask for help on that. I give kids a lot of credit for being smart and open-minded. Most of the songs on this record are asking questions, not providing answers. I like sparking thoughts and feelings. KCG: So you are a dad, producer, singer-songwriter and a member of Dog on Fleas. How do you manage to balance it all? DJ: It’s hard. I love it. But I always have projects hanging over my head. I mostly have to take my kids out in the woods or away from home so I don’t get sucked in to the business end of the music business. I don’t know if you’ve noticed that I’m terrible at Facebook and all that. I just can’t do everything. I’m always writing new songs for new albums when I should be promoting the album that’s just released. KCG: If you weren’t involved with music, what would you be doing? DJ: Maybe being a forest ranger. Or millionaire philanthropist. KCG: What is your favorite way to spend time with family? DJ: Hiking, climbing, picking wild blueberries, and singing. Do/Have any books influence(d) you or your music/songwriting? DJ: Little Fur Family by Margaret Wise Brown. I like the little world she created in that book. I like to create little worlds in song. It’s hard to talk about art and music for me. I like Paul Klee’s paintings. They are not so tied to this world, but evoking something. %&** I guess I am influenced by lots of things. Just feeling tiny sparks of energy wherever they show up. Great interview! I really love Dean’s contributions to the world of music! Thanks, Jeff! Agreed. Dean is an impressive fellow and I too enjoy his contributions (as well as yours!). I appreciate your feedback :).